Welcome to Inside Vossburg Supermax, where we take you inside one of the most dangerous places imaginable: a Level 6 super-maximum security prison. This sourcebook will give you all the information you need to use the Vossburg prison as a recurring location in your campaign, the setting for a one-time adventure, or as the focus of an entire campaign. 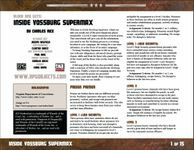 To bring Vossburg Supermax to life we provide you with new allegiances, advanced classes, prestige classes, skills and feats for those who guard the worst of the worst and for those who are the worst of the worst. A full map of the facility is also provided, along with a selection of NPCs who inhabit the Vossburg Supermax. Finally a series of campaign models that revolve around the prison are presented. So enjoy your time inside. Here’s hoping it’s not more time than you can handle.